PawPurrry: Blog Hop - Write A Post, Help A Dog! 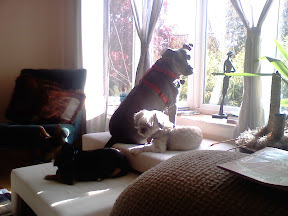 Blog Hop - Write A Post, Help A Dog! Suede wanted to write this blog herself being that she is a shelter dog but the lack of opposable thumbs made it difficult so she asked me to take dictation. I was in a kill-shelter, so for a few terrifying days I was one of the 4 million dogs that end up in shelters and rescues each year. Thanks to PEDIGREE’s Adoption Drive, attention has been called to the plight of homeless dogs. 4 million dogs also need to be fed and money is difficult to come by to feed these poor dogs. Pedigree will donate a 20 pound bag of their new Healthy Longevity Food for Dogs to shelters nationwide for every blog post about the PEDIGREE Adoption Drive. 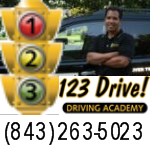 This is a special program which ENDS TODAY – September 19. Not a blogger? That’s okay, you can still help out. The PEDIGREE Adoption Drive is raising awareness for homeless dogs, throughout the year. 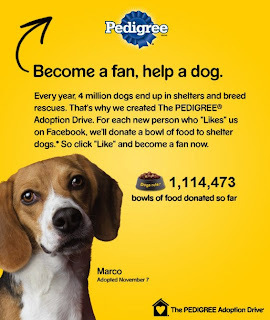 Through December 31, 2010, for every person who becomes a “Fan” or “Likes” the PEDIGREE Adoption Drive on Facebook, PEDIGREE will donate a bowl of food for each of the estimated 4MM shelter dogs. So far more than 1 million bowls have been donated. Tell as many bloggers, tweeters, Facebookers and social medialites as you can, so we can feed even more dogs. Tweet and retweet about this program by using the hashtag #dogsrule. Share on Facebook & Twitter to spread the word! Post, tweet, "like", feed a dog! See other blog hoppers blogging for a cause! This event was a lot of fun and I can't wait for the next one. It is a tremendous feeling to be part of something so big with something so small. Well done on bringing such a good initiative to the attention of your readers. Found for on Linkedin so assuming you spread the word there also?